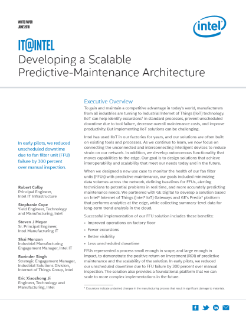 Intel IT developed a predictive-maintenance solution for its fan filter units (FFUs) using edge-to-cloud computing, while minimizing the amount of data transmitted across the network. Partnering with GE Digital, they have significantly increased FFU uptime. Azure Stack enables you to launch a seamless hybrid cloud that's agile and optimized on Intel® technology. Azure scales with Intel® technology to provide the flexibility for all types of workloads. What are public, private, and hybrid clouds? Mike Neil, Microsoft Corporate Vice President, shares Intel and Microsoft partnership and shared Cloud vision.